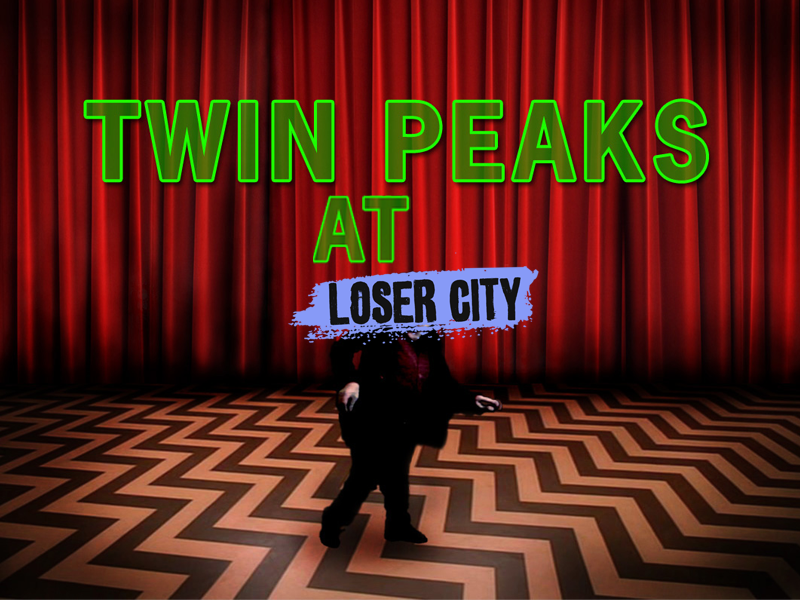 All week, Loser City is running Twin Peaks and David Lynch themed content in honor of the release of the new Twin Peaks boxed set, which came out today, July 29th. 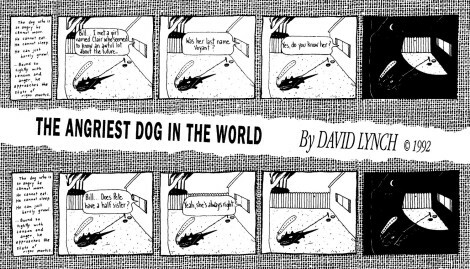 On the comics front, we’ve decided to revisit The Angriest Dog in the World, the strip David Lynch did for the LA Reader from 1983 to 1992. Back in 1973 David Lynch was angry enough that he sought out a therapist. But the therapist warned him that therapy could have an impact on his creative process and so Lynch left, eventually channeling that anger in a decidedly Lynchian way: through the creation of a comic strip about a dog who is so angry he can’t even move. That’s the story Lynch has told in interviews when asked about his absurdist comic strip The Angriest Dog in the World, which managed to run for nearly a decade but is otherwise a mostly ignored component of Lynch’s exceptionally weird career. The Angriest Dog in the World of course has notable fans, like Ryan North, who directly referenced it in his Dinosaur Comics, but for the most part The Angriest Dog is seen as another Lynch artifact to be cataloged alongside his personal coffee brand or his weather updates. The key difference is that The Angriest Dog is an intriguingly intimate glimpse at Lynch’s personal world philosophy. (Almost) every Angriest Dog strip is structured exactly the same, other than Lynch’s vaguely creepy declaration that “somehow an artist chose to include an increasing number of bones.” Each strip begins by providing the Angriest Dog’s statement of purpose, and the near “rigor mortis” state he is in due to being “bound so tightly with tension and anger,” before moving on to the dog in question, who remains immobile for four panels. In the background an ominous factory looms beyond a suburban fence, to the dog’s right is the house that contains the family that owns but seems ambivalent towards him– the only true presence in the dog’s life is his anger and the slight reprieve of darkness. The dog’s family is never pictured, but Lynch provides a sense of them through their conversations, which filter out the window. 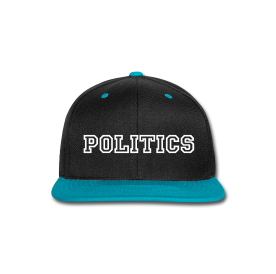 They state anonymous philosophical queries, like “if everything is real…then nothing is real as well,” or they offer punny jokes, or sometimes even slightly dirty jokes. Sometimes all the family has to offer are mysterious quotes from scientific texts, or nonsensical remarks that may or may not be folk wisdom. 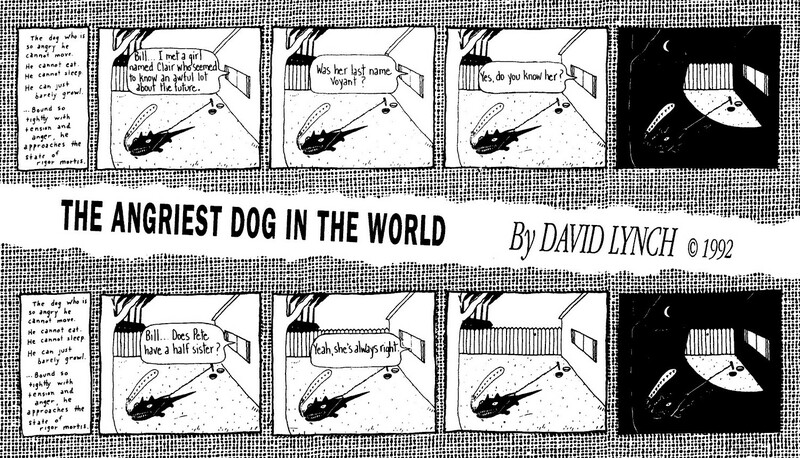 Lynch’s tone and style in The Angriest Dog in the World can be seen as surprisingly influential to modern gag strips like Red Meat and the aforementioned Dinosaur Comics, both of which also rely on static imagery and absurdist humor, but there’s a meta-element to the strip that its successors lack. Joe McCulloch, writing on the strip’s inclusion the Cheval Noir anthology Dark Horse published from 1989 t0 1994, told The Comics Journal that the strip received plenty of hate from comic fans, who wrote letters calling it a “useless, idiotic CON GAME of a strip.” That’s only fitting considering that Lynch felt “the humor in the strip is based on the sickness of people’s pitiful state of unhappiness and misery,” making the joke as much the audience’s reaction as whatever is being said in the panels. When the strip was in syndication, this was a pretty bold move on Lynch’s part and McCulloch connects it to a similarly bold move Lynch made with his sitcom follow-up to Twin Peaks, the disastrous On the Air. As McCulloch explains, On the Air was a show about ’50s live sitcoms that lasted seven episodes and “of its seven episodes, six share exactly the same basic structure, setting up preparations for a live broadcast of a television show in the first half then showing it all going wrong in the second half.” Just as The Angriest Dog has become a surprisingly accurate prediction of where comic strips would go in the 21st century, On the Air now seems like a bizarrely prophetic glimpse at the meta-sitcoms that dominate critics’ year end lists today, whether it’s 30 Rock or Community. Even the show’s failure places it in line with its successors, though it lacks the cults that have sprung up around those shows and Lynch’s own work. Artistically and commercially, we may have finally come around to what Lynch was doing with Angriest Dog and On the Air, but the most important and tragic element of the work is how little we’ve moved on from the “pitiful state of unhappiness and misery” that Lynch was targeting. McCulloch says our dog anti-hero’s schtick is “an endless cycle of self-defeating fury, in no way reacting to the unseen activities outside the frame, which are always diverse,” and personally I don’t know of a better way to summarize the current state of geek culture itself. Lynch is a weird auteur, an artist who is celebrated for his refusal to view the world in any way but his own, yet his lesser known works like The Angriest Dog in the World offer a purer glimpse at his true artistic intent, to show the absurdity of holding on to rage and anger, of letting those emotions dominate your perspective until you’ve created a depressing existence of stoic placidity, getting nowhere, never progressing.